At Myers Orthodontics, we believe everyone deserves a smile they feel proud to show off in any situation. That's why Dr. Myers and our highly trained team of orthodontics specialists work hard to design personalized, high-quality treatments that perfectly suit our patients' unique orthodontic needs, and why we strive to use the latest in orthodontic technology at our office. What many patients don't realize, though, is that treatment doesn't end when you get your braces off – in fact, that's only the beginning of creating your healthy smile! When you get your braces off, we're pretty sure you'll be fairly ecstatic about your new smile. But hold your horses: you're not quite out of the woods yet! Now comes the retention phase of your treatment, and it's one of the most critical parts of ensuring your new smile lasts you for years to come. While your teeth may be in new positions, the underlying bones, ligaments, and tissues that support them have yet to adapt to their new alignment and "set" into place. This means that without a retainer, your teeth will just move back to their original positions, erasing all your hard work! A retainer is a critical part of ensuring your teeth keep their new alignment, safeguarding your smile for years to come. We'll fit you for a retainer the day we take your braces off, and at the next appointment, we'll give you your retainer along with detailed instructions for wearing and caring for it. In general, there are three types of retainers we may prescribe to you depending on your unique situation. 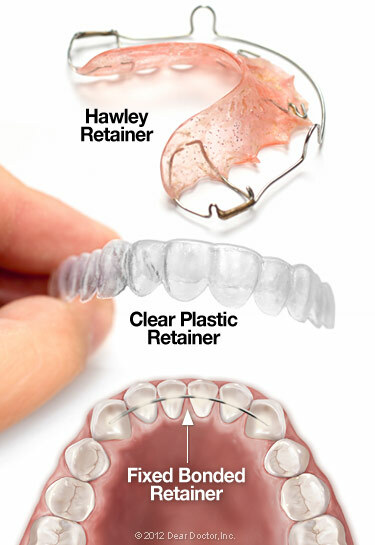 Hawley Retainer: The Hawley retainer is the best known and most iconic type of retainer. Made from a piece of acrylic molded to fit the roof of your mouth and a wire that holds teeth in position, the Hawley is an effective, easy way to safeguard tooth alignment. Clear Aligner: These retainers are similar to Invisalign clear aligners, and they fit directly onto the tooth arch. They're made from a thin, see-through plastic that perfectly matches your teeth alignment, and they're virtually invisible when worn. They're convenient and easy to remove, but a little less durable than Hawleys. Fixed Retainer: A fixed retainer, also called a bonded retainer, is a great option for patients with a high risk of the teeth moving back to old positions. As their name implies, these are cemented to the inside of the front teeth and worn constantly. They can't be removed except by an orthodontist, but they're hard to see because they're on the inside of the teeth and they provide a superior level of protection. In general, you'll find that a retainer isn't very obtrusive to your daily life. You may go through a brief "adjustment" period where you have trouble speaking normally or produce more saliva than normal, but these issues will fade within a week or so. When you first get your braces off, you'll likely need to wear your retainer 24/7. But as time goes on, you can reduce your wear to only at night, then every other night, and eventually to just a few nights a week. It's important to clean your retainer regularly to keep it fresh, clean, and to protect your teeth from bacteria. For Hawley retainers, you can just brush them normally as you would your teeth. Brushes can scratch clear aligners, so instead, we recommend soaking them in a glass of water with a denture cleaning tablet. To clean a fixed retainer, you'll need to brush it normally and use a floss threader to floss it. In addition to regular cleaning, it's also critical to always use your retainer case. We can't tell you how many stories we've heard of patients folding up their retainer in a napkin and throwing it away – and that's a costly proposition! Also take care not to expose your retainer to excessive heat, as this may warp your retainer. With proper cleaning and care, your retainer will help you safeguard your smile for a lifetime. Retention is a critical part of orthodontic treatment, and when combined with braces or Invisalign, it can help you achieve a healthy, beautiful smile for years to come. But don't just take our word for it! If you'd like to learn more about how orthodontic treatment can improve your life by recreating your smile, we would love to speak with you. You can call us at (865) 687-6560 with any questions or reach out to us at our contact page, or if you'd like to schedule an appointment at either of our Knoxville offices, you can do so using our easy online form.